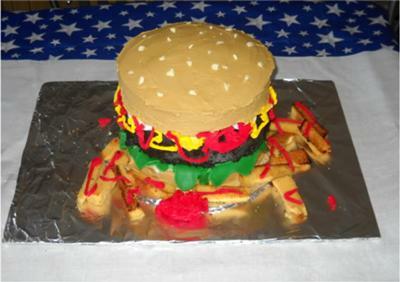 I made this hamburger and fries cake because we were having a family cookout and I really wanted to make something special so after browsing the internet for ideas I decided that a Hamburger Cake was PERFECT for a cookout. I decided to forego the “making from scratch “thing and opted to use cake mixes #61514; I used 2 Yellow Cake Mixes and 1 Chocolate Cake mix for the entire hamburger cake. The cakes were all made according to the box instructions and I made them in 9 inch round pans. While the cakes cooled I took a cardboard box folded and covered it completely with aluminum foil; this served as my cake board. I then made cream cheese butter cream icing; I decided that I would rather have more than enough icing than not enough so I made 4 batches. I tinted about 4 cups of the icing tan using Wilton gel coloring. I actually used copper and brown to create the “tan” color I wanted. I divided the remainder of the icing into three parts and tinted those black, red and yellow. I also purchased ready made fondant in red, green and white to use to cut out the condiments. I cut out round circles in various sizes in each color and then using a toothpick I made lines, holes and indentations so that the circles resembled pickles, tomatoes and onions. I then took the remaining green fondant and scalloped the edges so that it looked like lettuce leaves. Once the cakes were cool, the fun began. I trimmed one yellow cake so it would lay flat and would look like the bottom bun and placed it on the serving board and iced it with the tan icing. I then placed the "lettuce leaves" around the edges of the bun so that they hung off a little and would be seen when the cake was completely assembled. I the iced one of the chocolate layers with the black icing and the remaining chocolate layer was crumbled up in a bowl; I then took the iced chocolate layer and rolled it in the crumbs so it would resemble the texture of a hamburger patty – it does get messy but it is well worth it. I very carefully picked up the “patty” making sure to not touch the sides and placed it atop of the bottom bun. At this point I added the fondant tomatoes, onions and pickles and using decorator bags and tip #12 I piped red and yellow icing on the patty; making sure that I brought the icing down on the sides of the patty so it looked like ketchup and mustard. I trimmed the one yellow cake layer so that it looked like a top bun and iced it in the tan icing. This is where it got tricky, I needed to ice the layer BEFORE I put it on top of the patty layer to make sure I didn’t get tan on the sides of the hamburger patty but it was also the top layer so everything would be seen. I ended up holding the cake and icing the sides and top but left the bottom of the layer with no icing. I then placed the top bun on top of the patty and touched up with a butter knife the places that I touched accidentally positioning it. I then took white chocolate shavings and placed them on top bun so that it looked like sesame seeds. Finally, I made the fries using the remaining yellow cake layers. I cut the cakes in strips and placed them on a baking sheet and in the oven on broil they went. IMPORTANT** you must stand with the door open and watch the fries or they will burn. As soon as they began to turn dark brown…remove them. The edges will be dark but as long a they are not burnt…they will taste delicious and be crispy. I placed the fries around the bottom of the cake and then piped red icing all over them and made a pile of icing in the middle for the ketchup dipping. The cake was a hit with everybody and I did get several pictures but I didn’t get any of the condiments on top of patty #61516; and you can’t see them when the cake is assembled but because of the sheer size of the cake we actually served it in layers so when the top bun was cut the condiments were seen and loved by everyone. You could skip that step altogether but that small touch is still talked about a year later so I would recommend doing it. The kids loved dipping the fries in the ketchup so if you’re making this cake for them…..you might want to make sure you make a double (or triple) order. OMG THT LOOKS GOOOD I WILL EAT THT UP!!!!!!!!!!!!!!!!!!!!!!!!!!!!!! OH YEAH AND MY LAST NAME IS ASHFORD ! Now that is just tooooooooo cool! You did a fantastic job and you can really tell it was a lot of work!